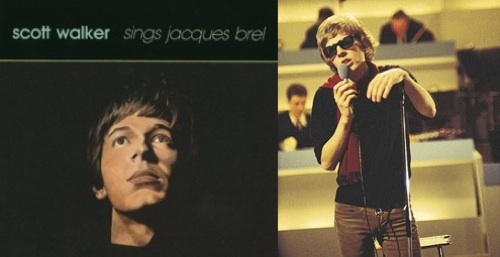 One of the documentaries highlights is when the fimmakers delve into Walker’s sixties work covering Parisian singer/songwriter/showman Jacques Brel both live, on his television show, and on record via the Scott Walker Sings Jacques Brel collection (comprised of nine tracks culled from Scott’s first three solo albums). If you’ve heard Walker cover Brel then you know his versions are nothing short of grandiose and bombastic, and done up in a way that retains both the original’s spirit and intensity. Listen to Walker cover Brel’s “La Chanson De Jacky” below. As an aside, as much as I love the Walker Brothers and Scott’s early solo records I still can’t get on board with his latter career experimental works (most recently The Drift), which is interesting as I have friends with the exact opposite take on Walker’s career. Different strokes, etc. Love to hear your thoughts on Tilt, The Drift, etc, in the comments. I too saw that documentary recently – I’d never actually heard of Scott before, though I did recognise one or two of the Walker Brothers tunes. It was interesting enough to make me consider getting one (or some) of his first 4 solo albums… I don’t think I’ll bother going further than that though. Thank you for this post. I’ve been hitting the first four Scott albums lately with the same gusto and entusiasism as one of his vocal performances. Scott has the most incredibly evocative voice in pop. I just love the over the top melodrama in his best early stuff. By the by, Jacques Brel was Belgian, not French. And Django Reinhardt for that matter. Thanks. I’ve yet to see 30th century man. My dad got the dvd but I never really cared to check it out. I will soon. I remember there was an interesting interview of Scott (together with Jarvis Cocker) on Q magazine (published some 2 to 3 years ago) which I enjoyed. Fun interview. I’ve been able to listen to Scott Walker fairly limitlessly recently, which is not something I can say for a lot of the music I come across. Tilt and The Drift were certainly a little bit more difficult to get into than the earlier albums, but I found that the documentary helped me appreciate those as well. ‘Til the Band Comes In is definitely worthwhile as well, and often overlooked in favor of Scott 1-4. You may find other things on God and My Toothbrush enjoyable. @kevin, right, I actually had ‘Belgian’ there originally, but switched to ‘Parisian’ (not ‘French’) to illustrate that he spent the majority of his life/career in Paris and was very tied to the arts scene there. 30 century man is one of the finest music documentaries i have seen. a friend turned me on to him about 5 years ago via the track “we came through” and i’ve been infatuated ever since. have to admit, i’m partial to his earlier, more conventional work but i do like tilt as well (still haven’t picked up the drift). lately, my favorite track has been “the lady came from baltimore”. he is truly a fascinating musician, i find his approach/attitude really inspiring. “Jackie” is perhaps my favorite song ever. 30 Century Man is on Netflix instatnt queue these days- everyone should watch it. getting into Tilt is simple. Listen to The Drift, all the way through, maybe 2-3 times, then put on Tilt. it will sound like Burt Bacharach by comparison. Seriously though, Tilt, as difficult as it is, is full of stunningly beautiful melodies and orchestrations and tons of Scott evoking those unnamable feelings. As for the Drift, it’s pretty great too, but maybe we’ll have to wait for his next record to make the Drift sound ‘pretty’. Worth noting that you can also do Netflix on demand through a Tivo or an XBox 360. That’s how we caught 30th century man as well – win!